As part of the Commonage Campaign run by the Ward 2 Forum Team, a Snap Poll was issued independantly utilising opinionstage.com. The results are thus independent and verifiable. To test whether residents felt the land should be sold to the highest bidder or whether a lease agreement should be entered into, should there be any development. 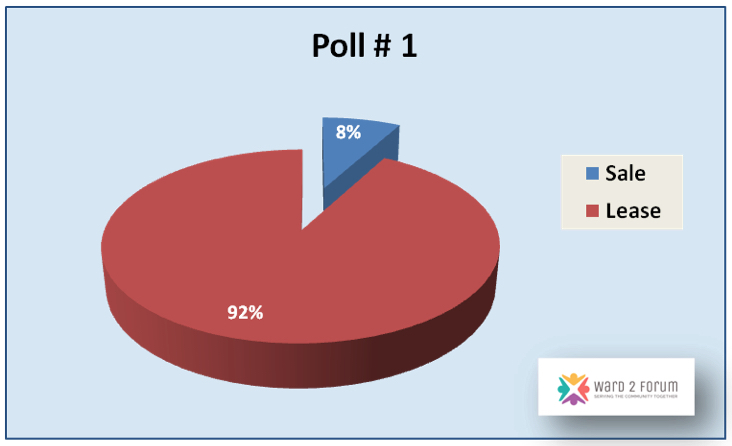 Results show an overwhelming support of 92.1% for the option of a lease agreement rather than sale of the land. The second part was to test whether residents supported the Ward 2 Forum proposal unconditionally, or with some changes, or not at all, or whether they had alternative ideas, such as e.g. no development at all. Again the results show overwhelming support for the W2F alternative – 52.2% unconditional support and 22.8% conditional support; a total of 75% support for the W2F alternative. W2F distributed a total of 9 documents with in-depth research regarding the proposal, so residents were well informed. There was ample time for comments and queries regarding the documents, with many residents participating on the W2F website and on Facebook. The poll was widely advertised on social media and via the W2F and anyone could vote. A total of 206 votes were cast, which is unprecedented for this area.